My parents were often told that I was a precocious child, not that they needed to be told. I didn’t always know why it was important to do something, but somehow I knew that some things had to be done. I was unusually eager to please but of course, I had no idea about consequences. This story concerns my mother’s 35th birthday as told to me by various family members over the years. A few years earlier my father had gotten a new job at a company on Cape Cod and not too long after that they had picked out a nice house in a small town. There was a bit of land with the house and my mother, originally from Newark, Ohio, loved to work in her flower gardens around the house. There were always flower and gardening catalogues around the house and now they could afford to put in some more upscale gardens. The focus this particular year was on imported Dutch tulips. She had wanted these tulips for many years and this was the first time that they were able to have them. Much planning went into this project, from placement, to type, to height, to color. This was going to be a masterpiece. By October, everything was ordered and delivered and the great tulip project began. Stakes and string were everywhere until all the bulbs were planted at the proper depth for a perfect bloom in late April or early May. Rarely did a week go by that winter without some discussion about the tulips. Did we put them in right? Did we arrange them right? As it happened that year, there was just the right amount of rain, just the right amount of sunshine, and just the right amount of warming temperatures for the perfect flower garden. By late March and early April, the jonquils and daffodils came up perfectly in their usual places. 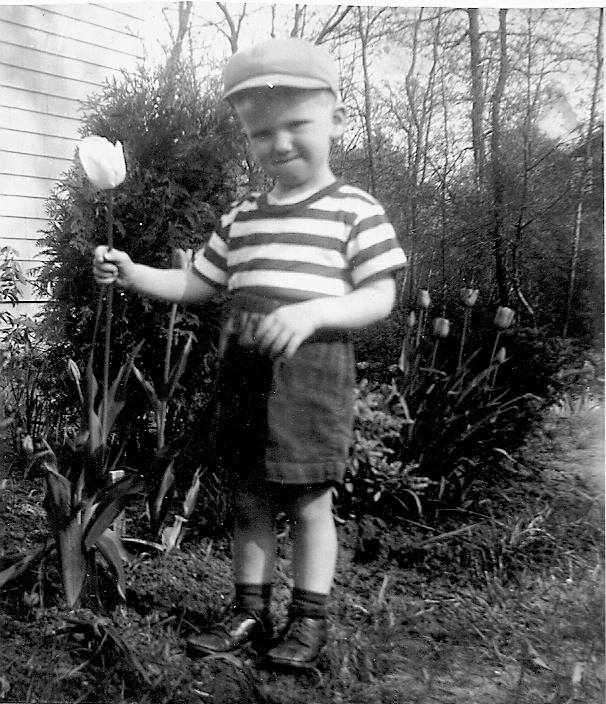 As you can see, my mother brought me out to see my very first flower garden. She was so excited and enthusiastic; I must have thought this was extremely special. Everyone was very excited that over the next month the now much-anticipated tulip garden would bloom. Each week there would be an inspection tour of the garden until finally the first of the tulips began to show through the ground. Day by day, everyone watched and waited until one Saturday morning the whole family went out to see the finished garden. I am told that there was never a more proud family on the street. Happiness filled the air, special meals were cooked, desserts were baked, and as it happened the next day was my mother’s birthday. That night when she put me to bed, I asked her what she wanted most for her birthday. She told me that she already had what she wanted more than anything, her beautiful tulips. I went to sleep that night thinking that I knew exactly what I would get my mother for her birthday and it would be the best present she had ever gotten. The next morning we all went to church and then as a special treat for my mother, we all went out to lunch. When we came home, everyone went about his or her own activities for the afternoon. Of course, my activity was playing out in the yard. Well, the strangest thing happened. No one spoke, no one laughed, and no one did anything. It was as if time had stopped for a few seconds. My father and mother looked at each other with an emotional cocktail that must have included rage, love, humor, and a dash of defeat. My mother gave me a big hug and thanked me for the flowers and we put them in a vase full of water. My father then thought it might be a good idea to document this little episode and with a shake of his head and a little smile on his face, the picture was taken. Please feel free to share this post on your favorite social media below. Gallery | This entry was posted in Uphill Both Ways and tagged character, children, learning, Life, literature, non-fiction, perseverance, persistence, WPlongform. Bookmark the permalink. That is so cute. I can’t imagine your parents holding it together like that. What a great picture to document the present. Thanks. Interestingly, it was the pictures that brought back the memories and made the story come to life. I love reading your stories. They are fun and interesting. Thank you, very kind of you to say. It was a different time. Your parents probably laughed about that for years afterward. It’s good to give people something to laugh about, especially when you’re too young to know you’re doing it. And when they accept the gift graciously, without laughing at all while you’re present. Thanks Kathy, I’m glad you like the post. Those were wonderful times to grow up. Nice build up. The best part is…..she loved you more! This story could be the story of so many. Very nice. I remember many a dandylion moment with my small ones….accepting the yellow pom poms with glee, and in spite of being greatly allergic to them, living the moment largely…..not letting on between sneezes… ha ha ….Parenting with restraint….and humor….not alwuz easy. Yes, restraint and humor. You’re lost without it. Thanks for reading, I appreciate it. Memories are definitely the sweetest when they bring you back to your childhood but most of all your mom. Thanks for your post. Thanks for stopping by Poemattic. Yes they are, I’m glad you liked the story. 🙂 I love this story! Your writing is inspiring and the reader is right there in the garden with you, as that wonderful birthday idea takes shape. Yes, I will definitely be back when I have more time (and with a glass of wine) to read more. Perfect! I knew exactly where this tale was going but still could not stop reading! I loved it! Thank you Emilio. I really appreciate that you stopped by and I’m glad you liked the story. only a son-child can think of that beautiful bouquet. And you remembered that day and what you did. Thank you and thanks for stopping by. I appreciate it. I hope you will find other posts here that you might enjoy. Thank you Kavita. I’m glad you like it. What a great story and a great memory. I’ve had those frozen in time moments. whoops! Thank you very much, I really appreciate it, and I’m glad you liked the story. This made me miss my mother more…how I wish I still have her around. Beautiful story! Thank you very much, I really appreciate it. I’m glad you liked it. Very much,sir! I’m just starting to blog,if you have time please visit jiche.WordPress. com I woul appreciate your honest opinion. Great story. I just started following your blog. I will be coming around often!! Thank you very much. Come back anytime, we’re always open. How we read out children wrong, beautiful post! You figured out the comments! Cool! I’m glad you liked the story. Yeah! It wouldn’t let me post via WordPress so I tried facebook. hmmm, that’s a little strange. Lovely story. Memories to treasure and share. Can’t beat them! Thank you very much Diana. I really appreciate it. Great story, JT. I’ve had similar acts of love from my children. My flowerbed was all set for planting at our new home. My oldest son, 10 years at the time, brought me outside to see my surprise. He had found a bag of leftover grass seed and planted my new garden for me. Seventeen years later, I’m still weeding out the grass.